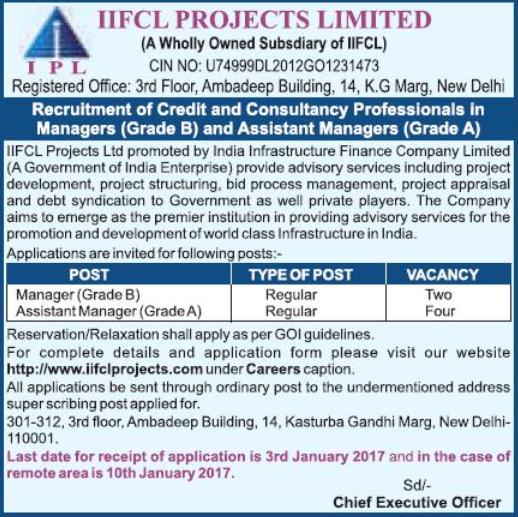 India Infrastructure Finance Company Limited has issued a notice to invites applications against 06 Vacancies of Manager Posts.Candidates with the required eligibility criteria are invited hereby for filling and submitting the application form through offline mode for the current openings on or before the closing date (3rd January 2017). How to Apply for IIFCL Recruitment 2016? Eligible contestants who fulfill the all term and conditions of eligibility must read all the instructions and information given on the notification cautiously and download the application format from official website of organization i.e. www.iifcl.co.in. Deadline to Submit the Application Is : 03-01-2017. Deadline to Submit the Application Is (Remote areas / Flung Areas) : 10-01-2017.